Home » Recently finished jobs » Damp proofing and Tanking works in Islington. Following our clients concerns over dampness within the lower ground floor of her home, Kenwood were called to assess. We found that rising damp was the cause of the problem as well as high external ground levels causing moisture ingress. Kenwoods have now treated the lower ground floor walls with the use of our chemical damp proof course injection. In addition to the injection to combat the moisture ingress we have used a tanking system. Tanking is a waterproof slurry which is applied to the walls below ground and creates a waterproof barrier against moisture ingress. 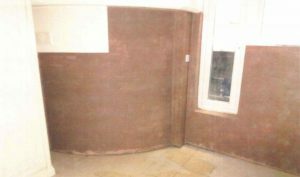 We have re-plastered the walls using render with added waterproofers to offer ultimate protection against dampness.